September is NICU awareness month. 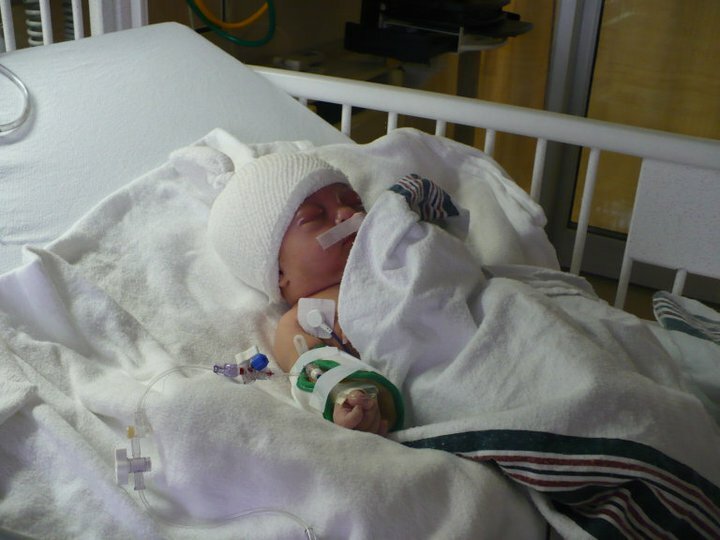 Most of the time, you hear about NICU babies being small, premature and extremely fragile babies. What you don’t hear about nearly as often, though, are the full-term, normal weight babies that seem to be perfectly healthy. That’s what I had. My daughter was due on October 26th, 2010. She decided she wasn’t ready, and on Halloween of that year I finally went into labor. In the wee hours of the morning on November 1st, after several hours of laboring at home, my husband and I headed toward the hospital. When we arrived, I was in full-blown active labor. We were quickly placed in a room, and found out that I was already dilated to 6 centimeters! Everything was going great, and I requested an epidural. After receiving the epidural, I was bedridden to wait out the rest of labor. From there, things didn’t go as planned. My labor stalled out, and I was put on oxygen. I stopped progressing even after my water broke. It got to the point where my daughter was just not going to arrive safely without going in for a c-section. Fast forward to being back in our room, post-surgery, with a beautiful 8lb 10oz baby girl. We had about 2 hours with her. Then, one of the nurses noticed something off about her nose. The pediatrician on duty had our daughter sent to the NICU at the hospital where I delivered, and ordered a CT scan. My husband was able to visit her in her NICU room, but it took hours before I was able to go to that floor to see her. What the doctors at that hospital saw on the CT scan sent us into a whirlwind. Our bodies as parents were functioning on autopilot. The doctors were talking to us, but all I could do was nod. I couldn’t really process what they were telling us. Our daughter was sent for more testing at Riley Hospital for Children, which was across town from where I was recovering. She was barely 12 hours old. I was devastated to say the least, but I began to pump breastmilk for my husband to take to her. I pumped the smallest amounts of colostrum, but it was something and he took it to her as soon as he could. After an MRI and more testing, it was concluded that our daughter was born with extra sacs of spinal fluid that were inside of her skull. These sacs needed to be removed as soon as possible. 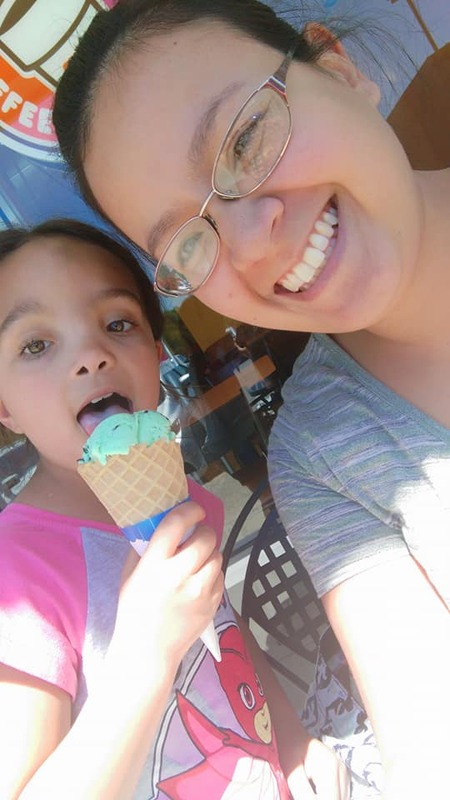 One had developed in the back of her brain, and another in the front of her brain, causing cartilage to grow and block part of her nasal passage. We were lucky enough to have an otherwise healthy baby, so while she waited in the hospital for her surgery, I was able to nurse her while we were together, and she took my pumped milk through bottles when we were apart. 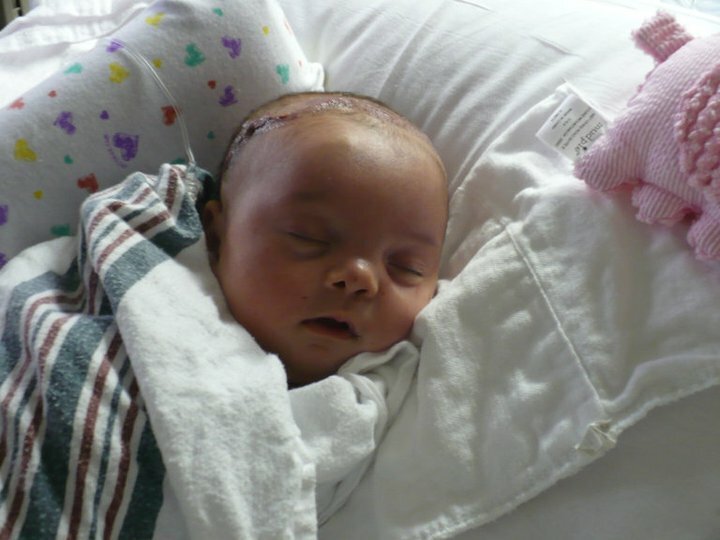 At 16 days old, on my husband’s birthday, our daughter underwent about an 8-hour brain surgery. Our family came to support and be with us while we waited. It was the longest wait of our lives. The nurses would come and update other families of the surgery patients periodically. But I never spoke to those nurses. I couldn’t. There are just no words to describe that feeling unless you’ve been in that situation. About the only thing I did, because it was the only thing I could do, was pump. I pumped a ton during her entire hospital stay. It felt like it was the only thing I could do during her surgery. I sat in that little room and pumped away. She came out of a successful surgery, and we were able to see her pretty quickly in the recovery room. Her little head had a helmet made of gauze and her eyes were swollen shut. I don’t know what I had expected, but it was shocking. I was told I could resume nursing her as soon as she showed interest. She was heavily sedated and hooked up to so many machines, so she took only pumped milk for the first day. Once her swelling began to subside and her helmet was removed, the nurses helped maneuver all of her many cords so that I could nurse her. She didn’t skip a beat and knew exactly what to do. We spent an additional 4 days at the hospital after her surgery while she recovered. We went home the Monday before Thanksgiving that year, and we were definitely thankful. Now, Maddy is a sassy, softball-playing almost 8-year-old! She has had other surgeries since then, and still has more to come, but she is the strongest little girl I know. I am proud to be her mommy, and without her experience in the NICU, I wouldn’t be doing what I do today to help other NICU babies!